We've not had any official school lessons this week, still there was plenty going on in our lives. So much so that I'm considering pushing our start date for second semester back a week. I'll see how the rest of our break goes. This past weekend Amber played her flute in a Christmas concert with the Vocal Fusion choir. She had a solo and then accompanied the choir. It was a long day for her with church in the morning prior to the concert. She played lovely, but it took all of her energy and she had nothing left the rest of the day. We didn't make it up to church to watch the Sunday School Christmas program. (Top-left) Performing her solo. She dislikes us filming her or taking pictures. I was actually behind a plant to get that picture! (Top-right) Last medical appointment of the year. She shouldn't look that comfortable in waiting rooms. (Bottom-right) Playing Narmia Monopoly with her dad. (Bottom-left) Waiting for The Hobbit. She would not stand by one of the movie posters though. 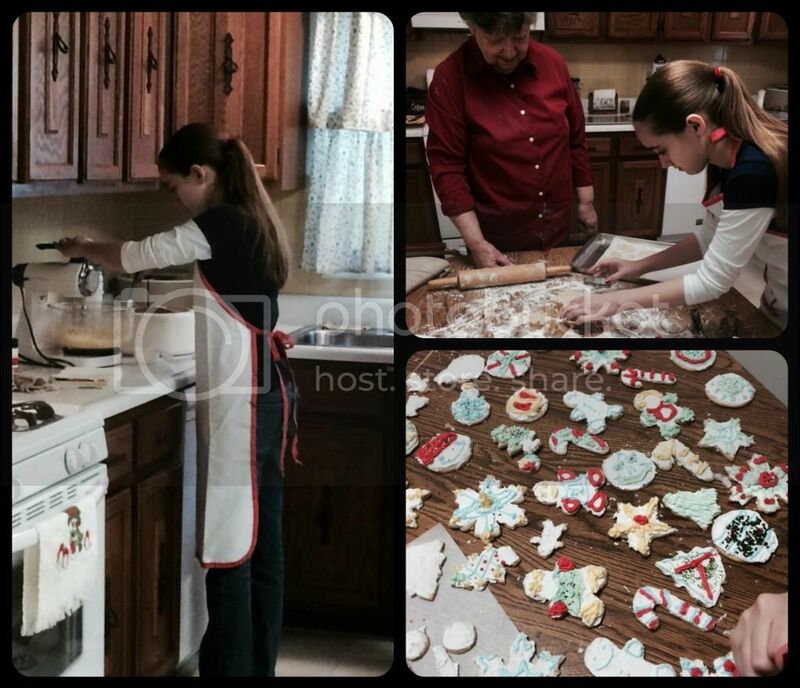 Monday was Amber's most anticipated day this month, other than Christmas: baking day at Grandma's house. She could hardly wait and had high expectations for it. I feared those expectations would not be realized, but the day exceeded Amber's hopes. Mom and Amber baked multiple types of cookies, including the favorite sugar cookies. Of course, Amber can't eat any of the cookies, but clearly the joy is in the baking and company for her. Amber started the day still tired but determined to enjoy it. 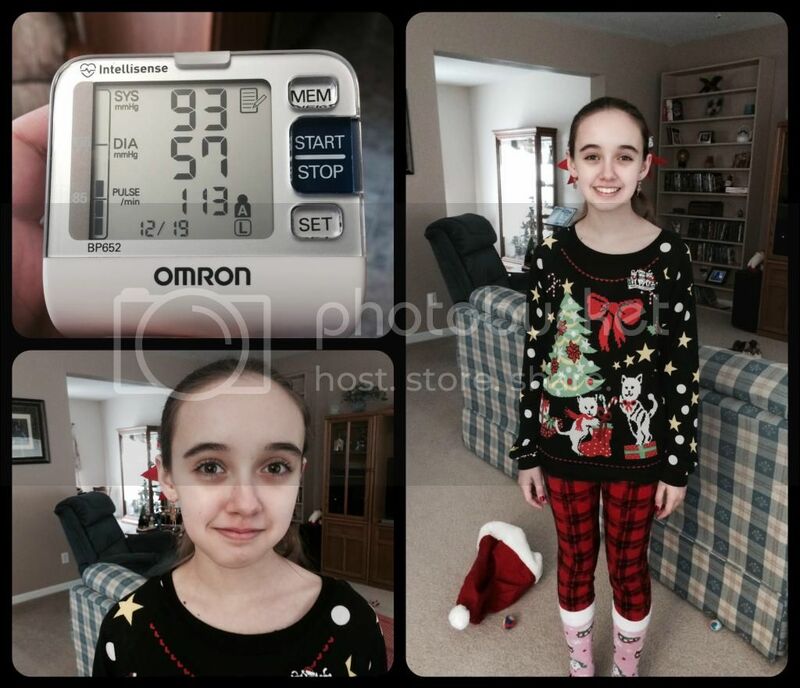 When possible, she sat down to lower her heart rate and drank lots of fluids. Mom and I helped as needed while Amber rested, but for the first time the girl did most of the baking herself. My mom did have all the ingredients prepped and the order planned out so that the day went smoother. I actually spent the first part of the day cleaning my mom's carpets since her leg isn't healed enough to do that yet, and really why should my 75 year old mother be cleaning her own carpets? On the way home Monday it had started raining, was dark and dreary and we were both exhausted. I couldn't wait to get home and just collapse (except that we all needed dinner still). Then Amber's tired little voice comes from next to me in the car, "Mommy, I'm so happy. I'm just so happy now." Well, doesn't that make it all worth it? And honestly, I was tired but happy too. It was a great day watching my mom teach Amber. Both of them love to bake. I bake from necessity but do not enjoy it. Later that evening Amber said to me, "Mom, you do a great job teaching me but there are things that Grandma does better." Yep. And that didn't hurt my feelings a bit, because it is the truth and Amber maybe has started to realize that I don't know everything. 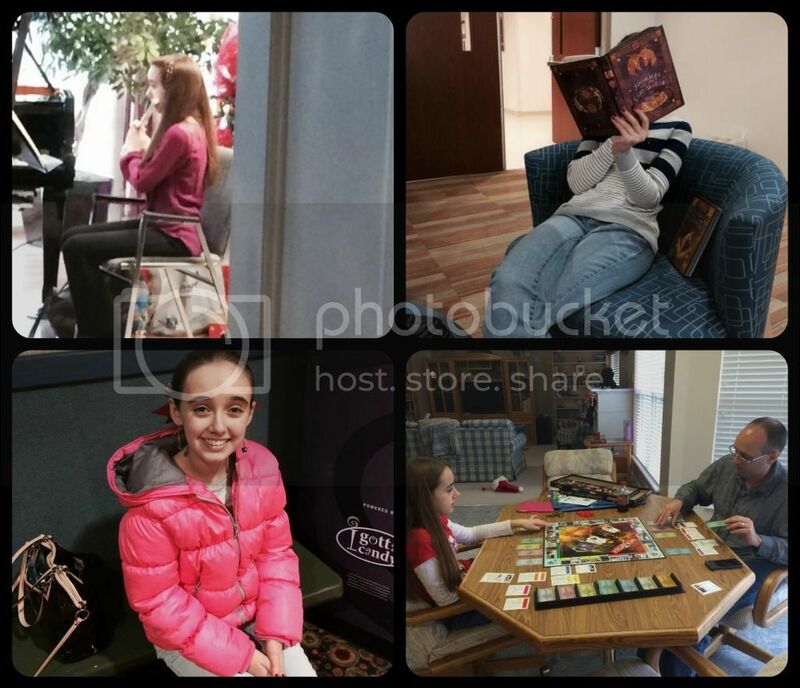 Tuesday, Amber attended an evening Christmas party thrown by a new friend from the homeschool co-op. They live around the corner from us. The only drawback to this party was that Amber was the oldest girl there, by 2-3 years. She enjoyed the party and already knew several of the girls. However, there were activities she couldn't do, there was food she couldn't eat, and activities she shouldn't do yet tried and then had to sit out for a while. Still the party made Amber happy again and was worth the exhaustion it caused. Wednesday we had Amber's last medical appointment of the year, assuming the AAG test doesn't come back positive before the end of December and assuming Amber doesn't catch the flu that is going around. From what we have been told, the flu is not something that Amber can handle. She will end up in the hospital. But we did a little bit of a happy dance after the dietician appointment because we have over two full weeks without medical appointments. Results from the dietician are that Amber is still growing fast and is now over 5'2". Grow little girl, grow. We also don't need to go back in to see the dietician for 6 months! She believes we have a handle on Amber's food issues and unless there is a decline we can go it on our own for a while. The endocrinologist also called me yesterday with the results from the adrenal testing. Amber is negative for Addison's disease. Thankfully. Her cortisol levels could be higher, but they aren't low enough to be of concern yet. 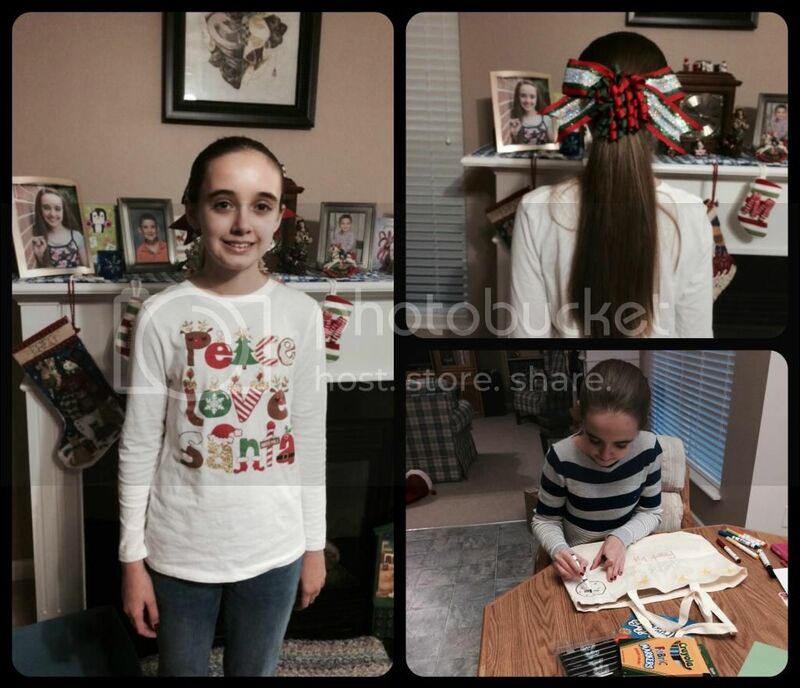 Ready for her friend's Christmas party, and working on a cousin's Christmas gift. Our last co-op classes of the semester were Thursday. It was a busy fun day with most of the teachers doing something Christmas related. It dawned on me, last minute, that perhaps we had people in our co-op who didn't celebrate Christmas. I know we meet at a Lutheran church (our church actually), and that most people in the group are Christians. I have the opposite problem of people who came from public school. Amber had always been in Lutheran schools so we had Christmas parties without worry of offending families. Luckily for me, it all worked out in my classes, especially German where we were covering German Christmas traditions and vocabulary. But I really did have a moment in the middle of my German class were I stopped talking to figure out who might not be celebrating Christmas. Today was the homeschool co-op Christmas party complete with an ugly sweater contest. Being such a stylish person, I own no ugly sweaters. LOL. Actually, I'm sure that's not true, but they aren't Christmas ugly sweaters. Amber purchased a special ugly sweater just for this party. Unfortunately, it wasn't until after we arrived at the party that we found out all the older kids had individually decided not to attend (or their parents' had decided they were too busy). Sigh. Amber had a rough morning and really wasn't feeling up to the party, but she went to be with her friends. We left early because Amber was feeling poorly and falling into one of her depressions over the party. Now she's sad and withdrawn. We're going to try some crafts in a couple of minutes and hope that helps. All dressed up for today's party in her ugly sweater, Christmas socks, and other accessories. The vitals are from before she even got out of bed. Sigh. Florinef is not working yet. Our weekend is equally busy as our week has been. We have tickets to the Christmas symphony performance and are seeing The Hobbit with the homeschool teen group. Fred, Amber and I did already see the new Hobbit movie in 3-D, but now we can see it a second time without all the plot anxiety. With the addition of characters that were not in the book, we were unsure how it would actually end. Are you ready for Christmas? We aren't. We still need to finish a couple of handmade Christmas gifts and wrap presents. And do advance Christmas baking for Amber and me. At least we don't have any events planned next week, except on Christmas day. Whew. It would be very hard for me to work so hard baking and then not be able to eat what I made! That thought does not seem to have even entered sweet Amber's mind! That says so much about her character! Many children would be complaining about that! I'm so glad to hear that the test for Addison's disease came back negative. That's one less thing for you all to worry about! I'm glad Amber had fun at the first party and hope she's feeling better about the last one. I'm praying that you guys have a very Merry Christmas and a healthier new year! I am glad the week went well for the most part. I love baking with Grandma. That is a highlight for my kids too. For me Christmas baking is fun and I am enjoying involving the kids. The clean up is never fun but the kids are getting better at that. The real joy for me comes from making someone happy with a gift of cookies. I am glad to hear that Amber is growing. I just measure Philip at 4 foot 8 inches. It really put it in to perspective just how small he is. He is growing though and his endocrinologist is happy with his progress. Merry Christmas!